This voluntary nursing project uses the skills of qualified nurses in hospitals and clinics in one or more of our regions in Ghana. 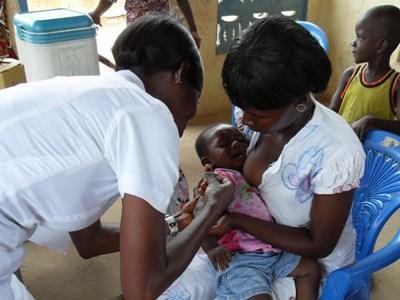 Volunteer nurses may be based in Accra, the Akuapem Hills, or Cape Coast. The hospitals and clinics in which we work vary in size and facilities, but will generally be less well equipped than in your home country. They appreciate the help of qualified nurses to ease the work load and provide training. This project is ideal for anyone qualified looking for voluntary work abroad or nurses on a career break. How can volunteer nurses help in Ghana? Dressing wounds, monitoring pulse, blood pressure, and temperature etc. Coordinating medical outreach programs within nearby towns and villages. As a qualified nurse you may be asked to lead some of the outreach work and supervise less qualified medical volunteers. Working at local orphanages to help with dressing cuts and wounds, teaching about basic hygiene, and prevention of diseases. Hospitals in Ghana are normally busiest in the mornings so this is when you will perform most of your work. However, you may be able to work some afternoons or night shifts if you are interested. You may also have the chance to spend some time in rural clinics. Your work will take place from Monday to Friday and an exact schedule will be organized by your project supervisor when you arrive. This voluntary work abroad will give you the chance to experience diseases and illnesses that are uncommon in your home country. You will be able to learn from local staff and discuss new ideas. Trainee nurses will also be eager to learn from your experience and you can really make a difference in this area. During your volunteer placement you will be able to learn about Ghana’s traditions, culture, and way of life. Staff at the hospital and members of your host family will also want to hear about your life back home and your family and friends. We call this "cultural exchange" and we think it helps our volunteers gain a new perspective on life. You need to be fully qualified as a nurse and have a relevant license to practice in your country of residence. Ideally you will also have at least a year’s experience of working as a nurse. To participate in the project, you will be required to register with the local medical council before your arrival. Please note that this requires an extra licensing fee, currently US$100, which is not included in the Projects Abroad program fee.